Experience city living in downtown Wichita! 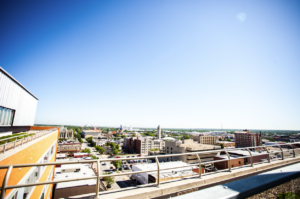 Bokeh Development offers multiple properties to live in in downtown Wichita. Whether you’re searching for a loft or a three bedroom downtown apartment, we’re sure to have something for you. Choose from The LUX, The Renfro, and Zelman Lofts. Each of these affordable downtown living options are available to see in person in the downtown living tour or by contacting us. If you’ve always wanted to experience city living with the energy and buzz that downtown brings, you can have it by living in downtown Wichita! Wichita, Kansas downtown living means that you can simply walk to grab a bite to eat or attend a concert. The possibilities are endless with downtown Wichita living in a Bokeh Development property! Bokeh Development offers plenty of affordable downtown living apartments, so be sure to check out our current downtown living residential spaces.